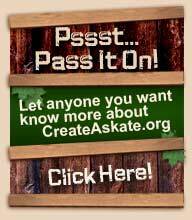 CreateAskate.org utilizes Pay Pal as our Credit/Debit card purchasing provider. You do not have to be a member of Pay Pal to purchase, you simply need to sign up and create a log in. (Note) All orders approved through Pay Pal usually ship within 1-5 business days. All check and Money order purchases generally have an approval/verification period of 10-15 business days once the order is received. This does not include shipping time so please review all approval emails from CreateAskate.org in order to calculate when to expect delivery. You will be provided with a tracking # once order is shipped as well.